This was the first tag I made, inspired by Tim's tag. I didn't have everything but I improvised with stuff I had in my stash! I didn't have any printed tissue paper so I stamped some plain tissue paper using Text-It from Waltzingmouse Stamps. Following the technique I used acrylic paints and a baby wipe to create the background. I rubbed the surface with some Distress Inks (Victorian Velvet and a little Vintage Photo) to bring out the detail in the creases. 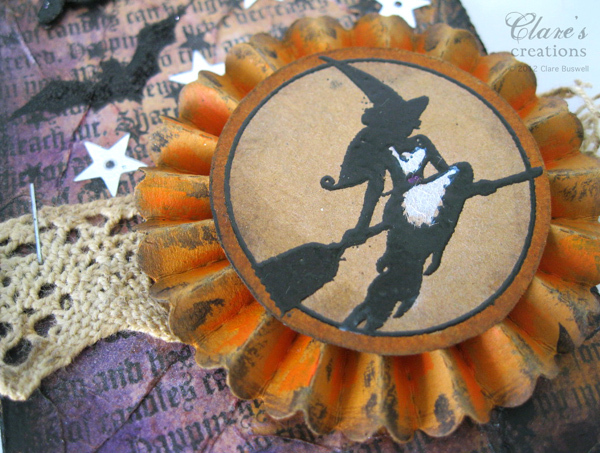 I used the Sizzix Tim Holtz Alterations Mini Paper Rosettes die (I used the larger one) to make the orange rosette and distressed with paint and Distress Inks (Antique Linen and Vintage Photo). For the center I stamped and embossed in black a circle of card with the witch from Midnight Feast from Waltzingmouse Stamps. I highlighted the witch's apron in white using Picket Fence Distress Marker. 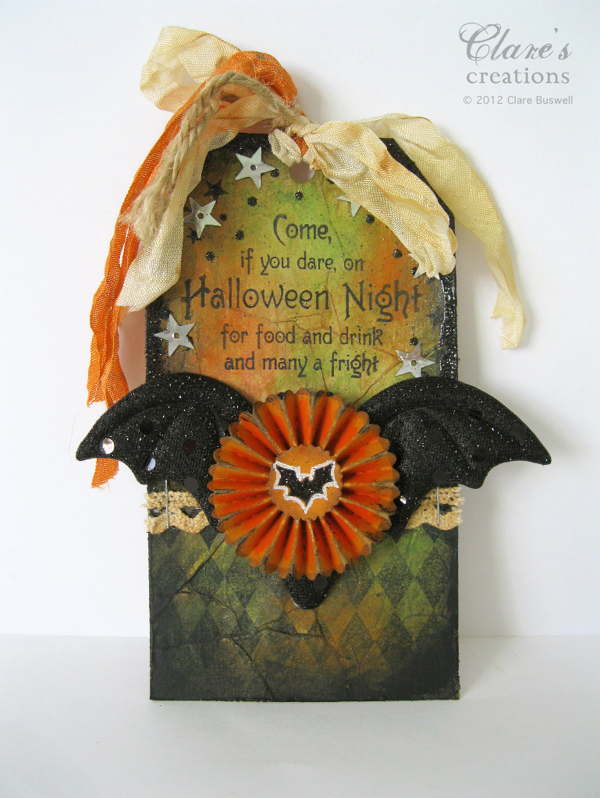 The bats I stamped are from Halloween Party from Waltzingmouse Stamps. Hooked on the technique (and I'd already made a mess) I decided to make some more tags! I used the same stamp set Text-It from Waltzingmouse Stamps to create the background and went with a bright green and purple color combo. I used some Distress Stains (Peeled Paint, Antique Linen and Walnut Stain) to color the seam binding, the Distress Stains are just perfect for this. 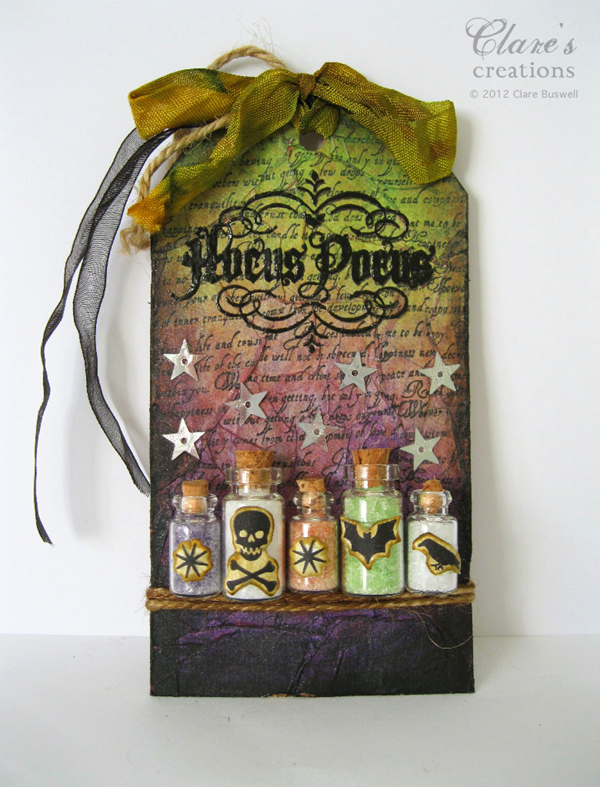 I used the Hocus Pocus stamp set from Waltzingmouse Stamps for the text and embossed it in black. 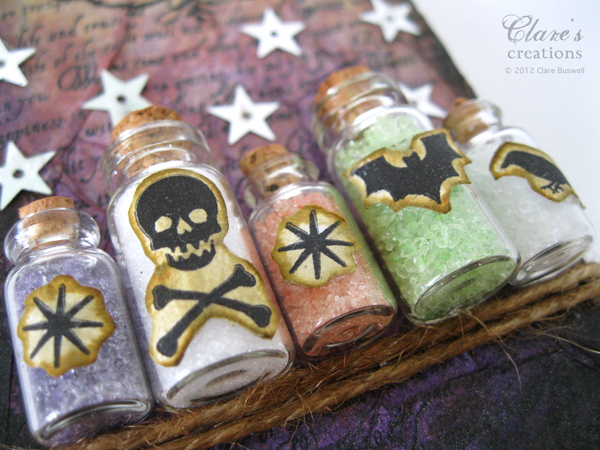 The little symbols I stamped for the bottles are from Hocus Pocus, Midnight Feast and Halloween Party from Waltzingmouse Stamps. I cut them out and inked the edges with Distress Inks (Antique Linen and Vintage Photo). The larger bottles are from Tim Holtz Idea-ology Corked Vials, the smaller ones I had in my stash but they all worked nicely together. The twine I inked with Distress Stain (Walnut Stain and Antique Linen). The little bottles I filled with epsom salts colored with diluted paint and left to dry! One more tag! For the tissue paper background I used one of the stamps from Heirloom Patterns from Waltzingmouse Stamps. I used the Sizzix Tim Holtz Alterations Mini Paper Rosettes die (I used the smaller one) to make the orange rosette and distressed with paint and Distress Inks (Antique Linen and Vintage Photo). I stamped the center with the bat from Midnight Feast from Waltzingmouse Stamps and outlined it in white using the Picket Fence Distress Marker. The text is from Halloween Party from Waltzingmouse Stamps and I stamped it after I created the background. All the black ink that I used to stamp on all the tags is Jet Black Archival Ink from Ranger. 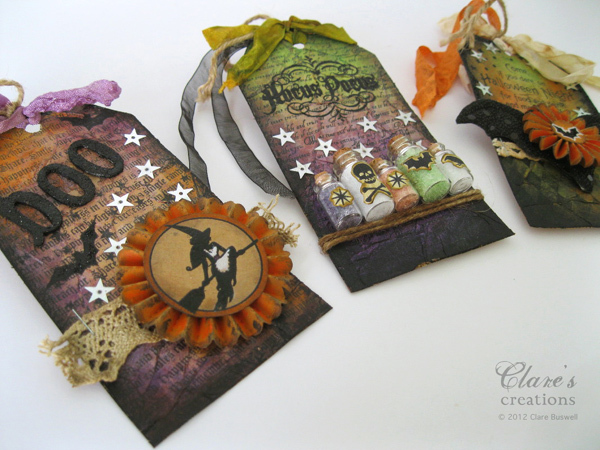 Labels: 12 Tags of 2012 October, Halloween, tags, Tim Holtz, Waltzingmouse Stamps. 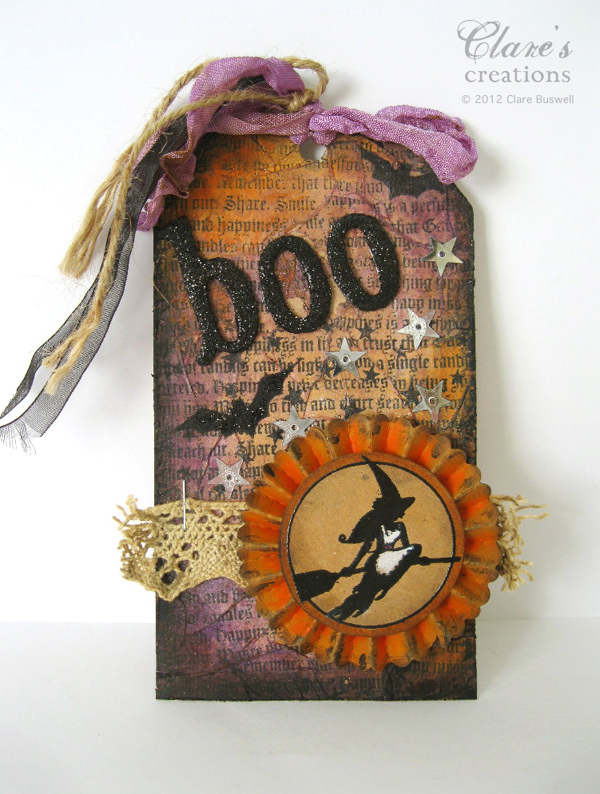 Clare I think these would have even Tim Holtz drooling! Love the distress ink blending and all the brilliant extras on these! I love all of your tags and was waiting for someone to use a rosette. Now I think I'm going to have to make a few more. Congratulations on having a winning tag! OH I love them all!! 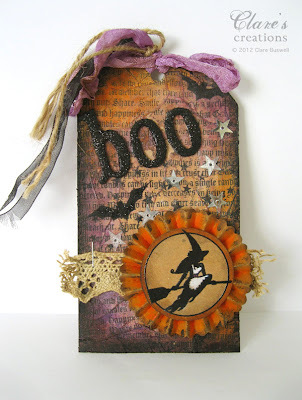 I made one tag...but I know I'm going to go back and do more, just because they were so much fun! I had to do a lot of improvising to do mine too. wow!! Clare you are amazing!! These are fantastic, thank so much for sharing them!! Totally cool tags. I especially love the row of bottles. Wow...these are all so artistic and gorgeous! I love every single one of them!! 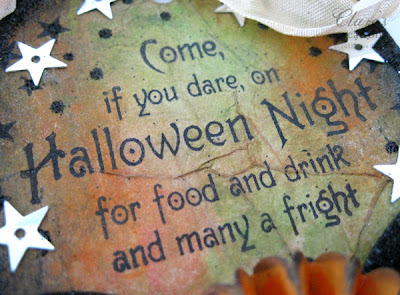 Those teeny bottles are amazing, and I just love the bat wings!! Those are fantastic! Love the touch of darkness. I love them all, Claire. The ebsom salts is brilliant. those are some fantastic tags Clare!! What a fun project: they look so great!! I love the mini bottles! those are fabulous! nicely done on all your tags! Don't make me choose! All 3 tags are wonderfully spooky. Hmmm, maybe that shelf of tiny bottles steals my heart. Then again, I've never met a rosette I didn't like. All 3 of these are just fabulous!!! Great imagination and coloration! Fab takes on Tim's tag! HI Clare. I love your tags and I saw your name among the winners on Tim's blog. Enjoy! Your tags are truely fabulous! I love the potion bottles and the bat. I'm so glad I clicked on the link on Tim's site that bought me to your blog! These are fabulous Clare! Love all the bottles. Congrats on your win! I like how you included the greens and purples, gives the tags a little boost! Your tags are awesome!! 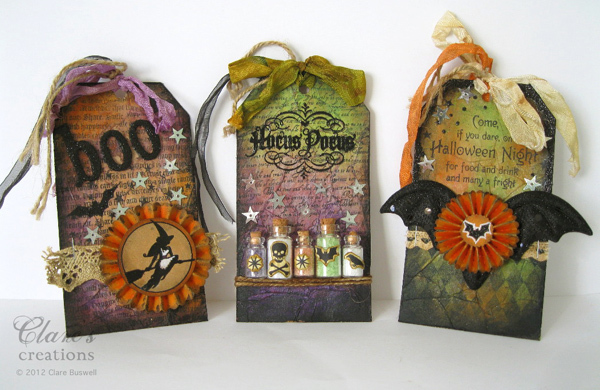 I especially like the one with the bottles - so creative!